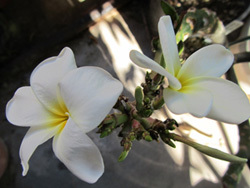 Plumeria's are a member of the Apocynaceae (Dogbane family). Plumeria obtusa is native to Tropical America, from southern Mexico, northern South America and the West Indies, Plumerias are rated to be small trees, to about 15-18 feet and is seen in a variety of solid colors. 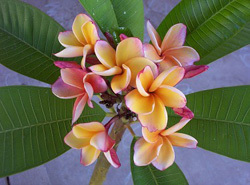 Plumerias as are divided into two main groups, the Plumeria obtusa and Plumeria rubra. 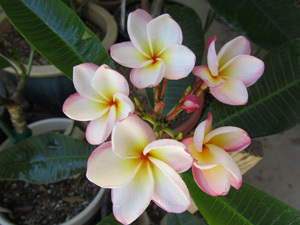 plumeria generally have white flowers while rubras have colorful flowers. 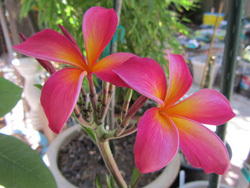 Rubra plumerias are more hardy and heat tolerant than plumeria obtusa and are therefore a better fit for outdoors in Phoenix with its temperature extremes. Plumeria rubra is native to Tropical America, from southern Mexico, northern South America and the West Indies, Plumeria is rated a small tree, to about 15-18 feet and is seen in a variety of solid colors. 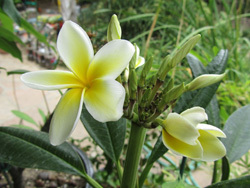 We have seen some Plumeria trees grow much larger The Plumeria rubra variety has lowers are about 2 inches long, arranged in 5 petals, are waxy and fragrant. They have light green leaves to dull green leaves with pointed leaf tips. They bloom in spring and through all the summer months. The variety flowers bloom in variety of colors including; whites, yellows, pinks , reds and rainbow.The tree themself is multi-branched and holds thick foliage. The young tree has green wood on the trunk and branches which become more gray as it matures. Plumeria rubra are decidous trees that loose there leaves when the temperatures fall below 50 degrees, in fact these trees even have brief dormancy in the tropics. 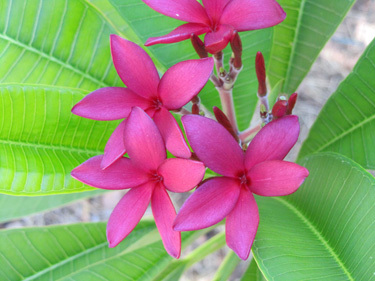 Although they are tropical plants, plumerias can handle a subtropical climate such as Phoenix,because they go dormant, shedding their leaves, when the weather gets cool. They can tolerate temperatures down to freezing and possibly a little cooler for very short periods of time. Given a goodmicroclimate, plumerias do very well in Phoenix. Plumeria rubra,"Celadine" "Common Yellow" - A large 3 ½" bright yellow lemon scented flower with a nice cream band on the petals edge. The flowers have a very stiff texture with good keeping quality. Medium tall well branched tree. 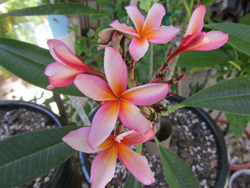 Plumeria rubra,"Jeannie Moragne" - Flowers are very large up to 5 1/2" and appear orange upon opening blending to pink at the edges with very showy red veins in th petals. There is a grainy overlay of red-purple light on the left side of the petal and becomes a dense stripe on the right which forms the apparent shades of red and orange. Plumeria rubra, "Kaneohe Sunburst" 3-4” deep pink and yellow flowers with brillant yellow centers adorn this medium sized tree. Flowers have a good texture and keeping quality and sweet fragrance. Plumeria rubra, "King Kalakua" "Minature White" - Small White flowers with brillant Yellow Centers and a fragrance similar to Gardenia. The petals are about 2" wide with pointed tipa that moderately overlap each other. Flowers have a good keeping quality. Parentage is P. rubra acutifolia. 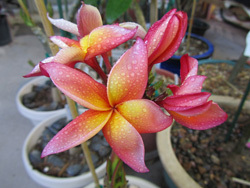 Plumeria rubra, "Penang Peach" - 3" Peach colored overlapped flower with peachy pink rays on edge of petal. Sweet frangipani fragrance that is an amazing coco butter/cinnamon scent. Small growing tree. Plumeria rubra, "Pink Rainbow" - 3" Dark Pink to light pink with brillant orange centers with dark pink rays on edge of petals and the back sides of the flowers. Slighty Sweet frangipani fragrance. Parantage Plumeria r. forma "Tri-color".